If you’re a restless sleeper—or simply prefer to keep bedding off your feet—you’ll appreciate the sheet and blanket support. Vinyl-coated steel support won’t snag or rust, slips under mattress, holds bedding up, away from feet. 20" arms accommodate many deeper mattresses. Arms hold approximately 25 pounds. Blanket support assembles easily without tools and folds flat during the day. Instructions included. It’s safe for electric blankets too. After having foot surgery, my toes were extremely sensitive. This product really took the pressure off of my toes and made me much more comfortable during my recuperation. The fold down design is very nice. 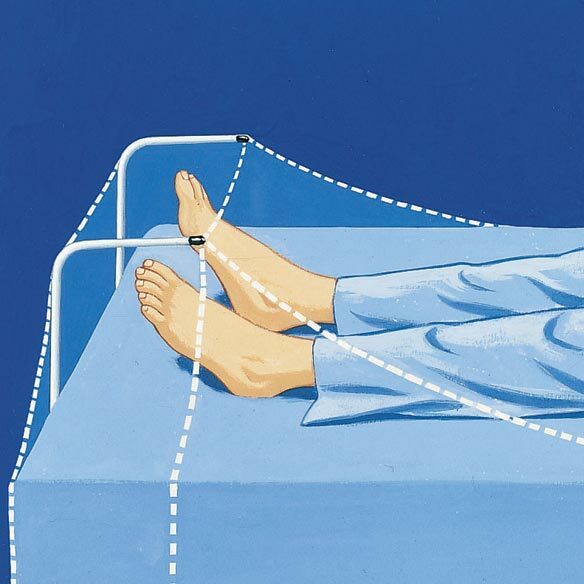 However the short support arms are not an advantage to a short sleeper, and the limited contact area with the blankets allows them to fall off a restless sleeper. I corrected these problems with an extender made from 1/2" plastic pipe, two elbows and two tees. It is 28" x 11" and slips on and off the support arms. It stores on the bed with the support arms. I think my adapter makes a good product better. It worked great! I had a ingrown toenail procedure, this wasn't my first one, so I knew how uncomfortable a sheet was on it, but I also new how cold my foot would get with my foot sticking out. It made my nights sleep so much better with it! It's exactly what I needed!!! Thanks Walter Drake!!! THIS IS A GREAT PRODUCT! I USE IT EVERY NIGHT FOR MY FEET COMFORT. iT COLLAPSES FOR DAY USE OF THE FULL BED. THE ONLY EXTRA STEP USING THIS PRODUCT IS TO LET IT UP AT NIGHT AND DOWN FOR THE DAY. wORKS PERFECTLY FOR LIGHTWEIGHT COVERS OF ANY KIND. perfect for me because I have gout in my foot and the blanket or sheet resting on my toes is unbearable..this product is perfect for me, wish I had gotten one a long time ago. Handy product if you have RLS. This is much better than using a pillow that takes up foot space. I have sensitive /hurting feet and do not like the blankets to weight down on my feet when I sleep. It is simple to install and does not interfere with changing the bedding. THIS IS A MUST IF YOU HAVE ANY KIND OF LEG OR CIRCULATION PROBLEMS.KEEPS SHEET AND BLANKET OFF LEGS.LOVE MY SUPPORT, AND YOU WILL TOO. Purchased a second set as they are not always listed, just in case they are needed. A no brainer to assemble with arthritic hands. Eases pressure on arthritic feet. Wish I had heard about it many moons ago. Great if feet or legs are hurt. We have used the blanket support for years on our bed at home. Were happy to see it back in the catalog and purchased one for our RV. Also got one for my Mother-in-law who has leg problems with heavy blankets. We use it to hold the bedspread or in summer the folded back blankets. I have had foot issues for a few years now and have not liked the weight of the blankets to be on them. I have been wanting one of these for a while and finally bought one. It has been the best think I have bought in a while. I am so much more comfortable now that I don't have to lay in one position only in order to keep the weight of the blankets off my feet. Great product so far! What I like most about this product is it's very easy to use. It folds down easily and does not need to be removed when making the bed or even when changing the sheets; and it stays hidden when not in use. It's also more sturdy than it looks and will hold the weight of a comforter easily. Alleviates pressure on your feet so you can sleep. My toes would burn with the blanket and sheet directly on them. I have not had that problem since I have used this blanket and sheet support. I have poor circulation in my feet sometimes make my toes sore. This holds the covers up off my feet making it more comfortable. OK here we go, more room to write. My husband used a basketball before to hold up the sheets, on top of that, it had Obama's picture on it. Something that finally works! It really lets your feet feel free while you are sleeping. I didn't realize that my feet were being cramped all night like they were in too short shoes. My feet/legs were out of align. When I began to use the blanket lifter, my feet/toes had room! I began to sleep more soundly, my shoulder was less sore--what a difference. This has been a major help in my sleeping better. Such a simple thing has made a major impact. Relief of pain with the sheet and blankets off my feet. I wish I had got it sonner. I like my feet "weight-free" and this product does a better job than the previous support I had. Its arms kept slipping down; it was designed differently than this product. Working it with my select comfort bed. "Worth the money for a good nights rest"
I am a back sleeper, I can fall asleep faster because I don't have the pressure on my toes. works perfectly. easy to assemble. great for diabetics and anyone who needs to have bed covers elevated over the feet. Keeps the sheet and blanket off toes.A big deal for those with Gout! Love that it keeps your heavy bed covers off your tired legs. As a senior, I have restless leg syndrome and this is just perfect for my situation!!!! Works just like the picture shows. My feet were cold though and I had to start wearing socks to bed. I also added another warm blanket over the foot of the bed to keep my feet warm. It is holding up a sheet and 2 medium weight blankets and has not moved or shifted in the 2 weeks I have used it. I have it on an adjustable twin bed. It's so nice to have space for your tired feet while in bed. No blanket weighing down your feet! It's a great invention. We bought two. The sheet and blanket support truly holds the sheet and comforter so no weight is placed upon your feet or lower leg. It easy to use, easy to clean and when you are not sleeping the arms fold down so there is no visible evidence of any support. The only thing I would say possibly negative is that if you move a lot when sleeping or have an extremely heavy comforter/blanket the arms my slowly slide down flat. I am a back sleeper who dosen't move alot and had no problem at all. And we have a sheet & average weight comforter. It is money well spent!!! I like this product, it helps alot with the weight of the covers on my feet, however I had to add a bungee cord for the top two legs to hold them upright while using them for the night. Other than that, great! Tried to glue rubber tips on but they came right off again. I worry the sharp ends will snag the sheets. I had foot surgery and the blanket hurt my toes. This lifts the blanket enough to relieve the pressure. I have fibromyalgia, and the weight of blankets--especially in winter-- used to cause pain in my feet and ankles. I used to keep a pillow scrunched at the foot of the bed to keep the blankets from weighing down my feet, but I constantly had to fuss with the pillow to get it in the right place. I was very happy to find this product! (No more pillow!) Our heavy winter comforter pushes down on the support brackets a bit, so I sometimes have to push the base back in at the foot of the bed before retiring. But it's far less hassle than fussing with the pillow! Definitely worthwhile if you're bothered by heavy blankets on your feet! Having arthritis in my hips, I change position often at night. The blanket support holds the covers off my feet and makes movement easier. I have arthritis in my feet(and I'm a back sleeper) so cannot bear the weight of covers on my toes. This item does the job nicely but have to tie it in position otherwise the arms move and/or close. Excellent folding feature when bed not in use. Too bad the shipping cost so much. Few blanket lifters are easy to lower during the day (without removing them completely). This product is easy to fold the arms across each other in order to make the bed without there being a tent at the bottom. Bad news is that as it is designed, the arms are very far out to the sides of the bed and do not lift the covers high enough. Worse, the blankets often slide off one or both sides during the night because of the design and also because the supports are slick, coated metal. It would be helpful if the supports had a neoprene cover or even a strip of fabric across the top. I taped strips of the soft, loopy side of velcro over two places on each arm and that helps prevent sheet slippage. When set up as designed, sometimes as I rolled over, the support would poke me in the foot (alarming) and the rubber tips that came with it fell off immediately and I had to replace them with ones that are tighter. Worst was that the support would not stay up in a higher position and would collapse. To fix this, I removed the rubber end caps from the metal support that the arms are attached to at the base and inserted a very thick plastic spacer over that and then wrapped it with a hard, but flexible rubber gasket like product that you might use to weather proof something -- only more rigid. That fix allows me to stabilize the support arms higher up and customize them so that they are almost at an 75 or 80 degree angle. This prevents the supports from accidentally poking me in the foot at night and also lifts the blankets high enough up on both sides. This fix has no impact on the ability to then fold the arms closed each morning. I have not found anything better, but it would be a lot better if there was a built in way to better secure the arms at a variety of heights for people with different sized mattresses or different sized feet. We have standard height mattresses and with the adjustments I made, it's really the best for our use as we want it to disappear easily when we make the bed during the day. We have an adjustible bed and it is also one of the few that would work well with our set up. Others run as high as 80 or 90 dollars and for the money, if you're willing to tinker with the design, it's a sturdier product than the ones shaped like a "U" and it's lasted a long time and is therefore a good value if you are willing or able to put up with or address the shortcomings and lack of the ability to adjust the height of the blanket support arms. iTEM USED TO KEEP BLANKETS, SHEETS, ETC. OFF MY HUSBAND'S FEET WHILE STILL ALLOWING HIM TO BE UNDER THE SHEETS, ETC. SO HE CAN BE WARM. THE FOLD DOWN FEATURE IS SO COOL - ALLOWS YOU TO MAKE BED WITHOUT ANY HINT THAT BLANKET SUPPORT IS AT BOTTOM OF BED. My wife is shorter than average, so her feet do not extend to the foot of the bed since the projecting bars are fairly short. Nevertheless, it does raise the sheet and blanket just enough to take off the weight and seems to be working as expected. I have been using this product for 2 weeks and have to say I am impressed. It is holding up my sheet and a heavy comforter. The product is pretty intuitive to assemble. The rods are a bit "thin," so I hope the design holds up over time. It works well for my queen-size mattress; I recommend ordering 2 if you have a king. This product works as advertised; my only problem is that I have an extra 2 inch memory foam pad on top of my mattress so could use longer supports. Miles Kimball customer service is excellent. You went the extra mile for me in my request for a second unit. Thank You. was looking along time for this item. It keeps the weight and pressure of covers off my feet. I have slept so much better since I started using it every night. It was easy to put together,and it was wonderful to sleep comfortably without having my feet all wrapped in blankets. I only had one small problem which was one of the rubber caps came off one side in the middle of the night.Since I fixed it, no more problems.I'm happy! MYMy Feet are finally free! I just hate the compression of my feet, especially when they are diabetic, really helps! It is great to have the shetts off your feet. The design is made to allow you to fold it down while not in use, which is nice, but at the same time that is the part that I dislike the most. I dislike it because the arms don't lock while they are up and you have to constantly adjust them. I love this product but, yes, it does need to be redesigned for today's thicker mattresses. I made my own fix by buying two of these. You will not need the flat section of the second unit. Take the second set of arms and attach it to the first set of arms with strong filament tape to the height you need. Use lots of strong tape in 6 or 7 places per arm. This secures the weight of the blankets and also raises them higher to fit your needs. If you don't make it too high it will fold down nicely as it was designed to do. I honestly cannot sleep properly without this blanket support. Try my fix and I believe you will enjoy what it does for your comfort. My husband's feet get hot, so he really enjoys this product. I was leery, but he said it works great! This product has "done the deed" for me! Not only do I have planters fasciitis, I have tarsal tunnel syndrome (it's like corporal tunnel in your feet) and I need knee surgery. I can't handle weight on my feet and was considering a purchase of a pricey down-type comforter. I have been tossing-and-turning for some time, never getting good rest. I read the "mixed" reviews on this product (especially the review that said it was not good construction). I finally decided to purchase one myself so that I would know for sure if it would work for me. Even though the price was right, I was still skeptical and thought I would wasting more money. This product was money well spent! I slept so good the very first night and the blankets don't get wrapped around your feet and legs. It's even collapsible. EXCELLENT PRODUCT even with a heavy electric blanket and a quilt! Thanks Miles Kimball for a great product. This is a great solution for a long-time problem. Husband loves it!! It needs to be a little higher because I have a pillow-top mattress. It only leaves 2-3 inches of room between blanket and matress when in use. But it does help to keep the weight of the blankets off my toes so I can try to learn to sleep on my back. I also have neuropathy of the feet and can't feel anything. This products helps to keep my toes from bending and causing pain. I have nerve damage in my foot and the sheet and blankets weight causes me to have foot and leg cramps. Holding the covers away from my foot gives me a comfortable night's sleep! It has helped keep my feet comfortable so I don't get foot cramps. It works exactly like I wanted it to. I had recent surgery on a toenail and have plantar faciatis so sometimes the covers press down on my toes or keep my feet prone which aggravates the plantar faciatis. It is bit annoying reaching under the top sheet to stand the arms up at bedtime or laying them down when i want to make the bed. But it is worth it-I would recommend it. It works great for us! My husband had a stroke 8 years ago and getting in and out of bed with blankets on his feet is painful. This keeps the blankets off his feet and he can move more easily and with no pain! The support does not bother me lying next to him. Besides the blankets being heavy at times, they would get tangled when he moved. Now they don't. We are so happy to have found this support! Works very well. My sore feet thank you. bought this for my husband.cannot stand blankets on his feet. Best thing I have bought, however, I would recommend clips or something to keep the bars in place upright. I have to sleep on my back and don't like the heavy covers on my feet. This works well and helps me get to sleep without keeping to kick the covers up to get comfortable decreasing restlessness. Thank you for this product. Aside from this review, I wanted to tell you that I teach in an occupational Therapy Assistant program and am always finding magazines to help our students provide patients with resources for assistive devices to make their life easier. I have found your magazine contains the most adaptive/assistive products for life enhancing of the aging of any of the ones I have found. Thank you for your company. This really works. Easy to assemble and use. I've been looking for something that keeps the covers up off your feet for a long time. I can't stand to have the covers crush my toes when I sleep on my back. This works perfectly! It keeps the sheets and blankets off my feet all night. The sheet and blanket support needs to be narrower to keep the blankets away from my feet. It was easy to install and helps somewhat, so I am using it. WORKS OK, BUT KINDA CHEAP. I FOUND ONE THAT IS BETTER QUALITY. It wouldn't stay together and my mattress was to thick. This would have been ideal if it didn't have a manufacturing defect that required me to grind a metal nub off in order for me to assemble it as directed. It wouldn't fit through the required hole, the cap wouldn't fit on the end, had to take a grinder to it to get the nub off. Then after all that, it still didn't work because our mattress is thick, with a 3" memory foam topper. It barely made it around the end. Disappointing. I wouldn't recommend ordering unless you have a 15" thick or less mattress with no toppers. My husband has MS and cannot move about in bed easily, so the covers being off his feet is helpful, also the weight being off his feet makes it more comfortable for him. Whether I would recommend it to a friend is uncertain. I thought the product would be of more substance. This item can keep the sheets off the feet if you use a small area of the bed, about 15"... move to the side of it and the covers hit your feet. Also, it's really difficult to make the bed over it. And, the arms wouldn't stay up because the caps came off the ends so I wound elastics around them and they've held since. Didn't return it but am not really satisfied. It's better than nothing. Could be sturdier and bigger. Does help keep covers off sensitive feet, legs. However, the covers can pull the support arms down. This products works with sheets or light weight comforter. But it falls under heavy blankets. Good product, just needs to be made stronger. Needed to be more stable and substantial. My mattress is extra tall (12"), and the supports aren't long enough to keep the blankets off my toes. The company offers shorter supports, but should offer long ones as well. I was expecting it to stay stationary like the picture. It spreads out at an angle and when it does this the height is reduced. It is workable, but I would still prefer the height. Good idea but a bit flimsy. Not for the extra-high mattresses. It barely comes over the top of a pillowtop mattress; it needs to be higher. It's a great product.It just needs a support across the top;so the covers won't touch your foot. Use the product for which intended. I've had numerous surgeries and wanted to try something to hold blankets off my foot. It does a good job of that but if you are a person who moves around much, the 'arms' can slip down making it very uncomfortable. Since this was the cheapest I found, I decided to try it. Would I get it again when this wears out? Probably not, I'd probably pay more for a sturdier one that won't slip during the night. Directions are hard to understand. I wanted something to keep bedding off my feet so my cat wouldn't scratch as she played. The wires are to thin and would bend with more then 1 blanket. Not easy to make up bed as the support doesn't fold down as reported. Even with rubber tips the wires will poke holes in the bedding over time. This is a very flimsy bed cradle. It collapses to the fold position during the night so is useless for holding up the sheets. Don't waste your money!! I have ingrown toenails and must sleep on my back because heavy blankets make that problem worse. I also have to sleep on my back because of bursitis in one hip and because I use a CPAP. Both my podiatrist and my occupational therapist thought a product like this would help. It might have, but . . . It's way flimsy. I have a twin bed against the wall on one side, so the rack can't be folded flat during the day. If I want the bed to look "normal" I have to take the thing out and put it back the next night. That's a drag. It also lets in a lot of cold air, and I have very cold feet at night anyway. I wanted to like this, but it's not proving very satisfactory. In the summer in warmer climate, or if I had a double bed or larger, or if it weren't so flimsy, it might work better. A good idea, but poor execution. I am not using the product because it doesn't fit a full size bed well. I found this product to be too small/short for my smaller frame. Blankets were only held up at the very end of the bed...no help. Also the arms kept sliding apart. I really wanted this product to work. Big let down. I'm dissapointed in the product it is not working it keeps falling down and not holding the blankets up at all!! I'm back to the pillow I originally was using!! We would not buy this product again! We ordered this sheet and blanket support because the ad in your catalog said it was for the newer higher mattress. About 20 years ago we bought the same one ( from you ), but at that time there were no higher mattress's made and it worked just fine. When this one arrived and we put it on the bed, it was the same height as the old one! Plus it was made thinner than the old one! I received NO directions on how to put it together and the article does not say that it does NOT fit a single size bed. Also, very poor customer service at Miles Kimball to return it. Easier to throw it away and let them keep the money than argue about it. I am sorry I bought this. Don't buy if you have a thick mattress! It is not high enough with our thick mattress. Doesn't stand straight up as shown in the picture. The supports lay too far over to the side so the clearance of the sheet/blanket is only about 2 inches if that. Very disappointed and I would not recommend it at all. it just does not stay together and collapes very easily if it could be made in a U shap under the boxspring and mattress and up and over the feet would be great. 2 feet for all 3 sides would be perfect. A joke! A waste of time, etc. Will not support blanket and sheet. Not only would it not support both sheet and blanket, when I went to return it, the postage was $2 less than the total price of the item. I will not order from this company again. It's a great idea but did not support the weight of the blankets and the sides collapsed. We returned the product. I would never buy this product again. The sheet and blanket support is defective. The "legs" are too big to fit into the holes of the support. I returned for refund. This is easy to put together, but it does not stay put. The arms fall down with movement and are not tall enough to keep the covers off. I am going to send this back. I was disappointed. I totally think the sheet/blanket suppoort is over priced for the POOR quality... It does NOT stay in place and weight of a single fleece blanket will cause it to collasp on 1 side or the other.. Would NOT recommend it.. However, the "BATHTUB STEP" is of great high quality and fits great at my mobilehome tub.. My daughter is even interested in it.. The doggie steps: well my doggy won't use them!! I bought two. They can NOT be put together!!! I spent almost $29.00 on two. What a waste of my money!!!!! What a scam!!! !they dont fit but their refund policy will deduct $7.00from me..i can understand if i simply didnt like but this is not the case. This cannot be put together at all..
What a disappointment. Nothing like pictured. Came in parts that were bent. Since it would have cost me more to return it then it cost, I threw it in the trash. I would Never buy this product for any reason! One side of product is fine and works well enough for a light weight blanket. The other side is not properly supported and fails so blanket falls down. You can't get the thing to fit right under the sheets, plus it its not enough room length for your feet to hold over. I had hoped that this would work and it did. However, I didn't care for the looks of it, difficult to make my bed even though it was collapsible. It wasn't the fault of the sheet and blanket supporter, it did what it was suppose to. I am happy that I tried it. Perhaps someone else will have a different experience. This was for my father, who has diabetes and his feet are sensitive. It just doesn't work. It collapses and is too light to hold the blanket up. This is a piece of junk. It claims to fit thicker mattresses but it doesn't. When I used it the sheets only went up maybe 2 to 3 inches. My mattress isn't 17 inches thick. The arms don't stay up during the entire night either. Won't recommend this at all. Satisfactory only after I modified it. The item did not stand straight up as shown in the catalog and on-line picture. We purchased this product to keep bedding away from my wife's feet following foot surgery. As it came, it would not have been satisfactory for our needs. To make it stand up straight, I had to fashion a piece of wood to hold the arms at a good distance. Then, to keep it from collapsing side-to-side, I used heavy duty nylon string to hold it upright. After that, the product was usable. Thank you for the opportunity to comment on this product. Completely useless. Very poor design. Not substantial. It is too fragile to hold anything but a light weight sheet or it collapses. Totally useless. My son is trying to figure it out. Can't use wih a deep mattress. I have a fairly deep mattress. The blanket supporter only holds the blanket up about 3 inches which is not near enough. I'm about 5 foot 3 inches. My feet don't reach where the support is. Also the support needs to be stronger. couldn't turn over in bed without kicking the legs out from under the top. We've tried all sorts of things to keep the arms from falling over, but everything has failed. we traveled the entire lower U.S and enjoyed every minute of it. we met wonderful people. we didn't like the desert. Husband has problems with covers on feet! For my elderly father who has foot problems. I have been looking forever for this! Very happy to order. Have very sensitive nerves in feet, surgery on foot and hip, must keep sheets off toes. Knew from a hospital visit years ago that this kind of product exists. A relative with sensitive feet may benefit now. Because of medical issues I have to sleep on my back. Some of my toes are sensitive to a blanket lying on top of them. Hopefully this works better than the one I already have which has a bar across the top and is just a hair to low. This will b helpful for a friend, caregiving client. am having problems with my feet. I have neuropathy. Have pain in toes when covers touch them at night. it was recommended by our home health nurse. I tried local to find something and this was the best choice. I have been looking for this for years. I'm tired of having my feet rubbed and this seems like a good solution. This was recommended to me by a friend who purchased one for her mother and was very happy with it. It was not necessarily this brand, but one like it. I have neuropathy in both my feet and it flares up terribly at night. Having the covers on my feet just drives me crazy. I'm really hoping this works! Ordered the blanket extenders to relieve the tension off our legs while sleeping. Presently use a rolled up pillow. at the foot of the bed. The release of tension also releases my restless leg syndrome symptoms. Does this fit on a queen sized bed? BEST ANSWER: Thank you for your question. Tip to Tip of the support is 24" wide. The bottom width in the area between the box spring and mattress is 28” wide. The height from there to the top is 20 ½”. The base that goes under the mattress measures 7” long x 9 7/8” wide. We hope this information will be of help to you. What weight of sheet and blankets does it hold up? My Mom uses a lot of blanket on lower legs and feet. BEST ANSWER: Thank you for your question. The arms hold approximately 25 pounds. We hope this information will be of help to you. What size bed does this fit? BEST ANSWER: Thank you for your question. The sheet and blanket support is 24" wide from tip to tip. We hope this information will be of help to you. BEST ANSWER: Thank you for your question. The bottom width in the area between the box spring and mattress is 28” wide. The height from there to the top is 20 ½”. The base that goes under the mattress measures 7” long x 9 7/8” wide. We hope this information will be of help to you. How does unit fold down? BEST ANSWER: It does fold down but requires that you pull it out from the support. Folding it down is not convenient but can be done. Thank you for your question. The Support will does not fold down. It will need to be taken out from between the mattress, if you would like the blankets to lie flat. We hope this information will be of help to you. The support arms on the sheet and blanket support just fold inward to lie flat. Will it work with a hospital adjustable bed? Thank you for your question. This item will only work for standard beds. We hope this information will be of help to you. can you use this for recliner? BEST ANSWER: No, I could not put it together. You might have better luck with putting it together than I did. No , I don't think so. Will it work on a pillow top matress it is higher than a standard matress? BEST ANSWER: No, it didn't work for us.